If you are planning to attend this year’s Oktoberfest and have yet to book a hotel, you’ve left it too late. Your best bet is either to reserve something outside of town and make ample use of the outstanding German rail system or book through a travel agency that has an allotment of rooms already set aside. Failing all else, sometimes last minute cancellations and no-shows will open up rooms at larger hotels for the traveler canny or lucky enough to be in the right place at the right time. If you can, try to learn a few key German phrases before you go, such as how to ask for a beer or a menu or exchange some basic pleasantries. It is fairly easy to get around the wiesn and Munich itself without any knowledge of German―the Japanese beside me at the Ochsenbraterei were managing without German or much in the way of English!―but no one likes to be the boorish visitor who can’t even say “thank you” in the native tongue. Be prepared to arrive at the wiesn early if you haven’t reservations for any of the tents, especially on the weekends, and be gracious if someone with a reservation does come along to kick you out of your seat. 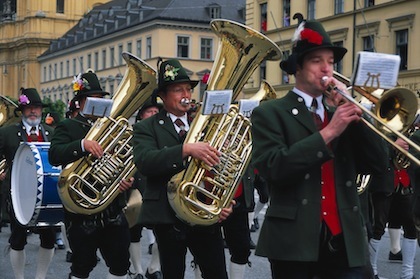 Note, too, that this year’s bicentennial edition of Oktoberfest will feature an extra Monday on October 4 and no tent reservations at all are being accepted that day. Carry cash, since credit cards are awkward in a tent setting and may not even be accepted, and tip the servers. (Tipping may not be the norm in much of Europe, but it is proper form at Oktoberfest.) If you are with a group, arrange a meeting place and time in case you get separated. Stephen Beaumont is the author of five books and countless articles on beer, spirits, food, travel and how it all goes together.